Monday’s article (“Two Early Signs of Dementia You Won’t Believe”) got me thinking a little bit about my own personal experience with dementia. 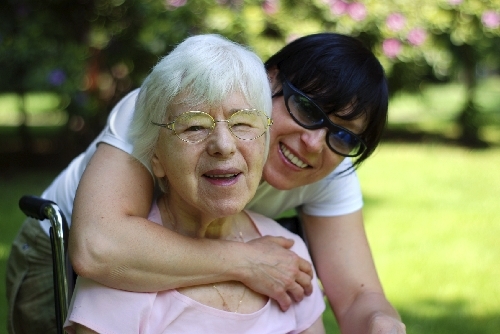 As I’ve come to know through an experience with a family member, talking to someone with dementia can pose a number of challenges, but one key area of concern is dementia and communication. However, there are key ways that you can effectively communicate with someone who has a cognitive disorder. To help you with this, I’d like to share a few things I learned while my grandmother was ill with the disease. About 12 years ago, I flew across the country to visit my grandmother. It had been about a year since I’d last seen her, but this time I wasn’t visiting her at her apartment—I was visiting her at a long-term care facility. She had been diagnosed with dementia and her condition was rapidly declining. This is when I started to learn that there were challenges associated with how to talk to someone with dementia. One morning, I told her that my wife and I were going to buy some lunch and we’d bring it back to eat. She said not to worry about it, that she had plans with friends in the facility and that we should come back the next day instead. About three hours later my phone rang and it was my grandma, wondering where we were. We went back to the home to visit her and everything was okay. Instead of correcting her or arguing about what was said, I figured it would be smart to make her more comfortable and diffuse the situation. Arguing with someone who has dementia is not beneficial to anyone; it will just make the situation more stressful. When you’re talking to someone with dementia, you have to abandon your ego and the need to be right. If they want to call a relative that’s been dead for a decade, pull your phone out and dial your own home phone or cell number and leave a message. When dealing with a person with dementia, you want to make sure you’re always working to keep their dignity up. Redirecting them is another tactic that can be helpful. If you don’t want to make the phone call or if they ask you to call again, say something that relates to that person. Something like, “Aunt Margaret loves puzzles, would you like to do a puzzle or go for a walk?” This might lead their mind away from the call and provide a useful activity to keep them occupied. Using the word “remember” can be a bit of a problem when talking to someone with dementia. It can make them feel embarrassed and uneasy, which can lead to depressive symptoms or feelings of isolation. Try to be conscious of this. Finally, I learned that it’s best to stick to yes/no or this/that questions. When trying to get them to do an activity, always provide two options, like “Do you want to take a walk, or do you want to do a puzzle?” Questions that don’t require long answers are also helpful because it reinforces their control, decision-making ability, and confidence. Communicating with people who have dementia can be a challenge and even frustrating, especially if it’s been a person you’ve known for a long time. Accepting their condition and doing the best you can to make it as easy as possible on them is extremely important. Henrique, R., “How to Communicate With Someone Who Has Dementia,” Globe and Mail, September 22, 2015; http://www.theglobeandmail.com/life/health-and-fitness/health-advisor/how-to-communicate-with-someone-who-has-dementia/article26478669/.